Separated from the mainland by a narrow channel, Fraser Island is the largest sand island in the world. Fraser Island is World heritage listed and almost the entire island is a protected National Park. Fraser Island accommodation ranges from motel units to houses and flats. On the mainland, the city of Maryborough and township of Hervey Bay provide both a stepping off point to Fraser Island and are worthwhile destinations in their own right. The Great Sandy Strait, separating Fraser Island from the mainland, is listed by the Convention on Wetlands of International Importance (Ramsar Convention). Hervey Bay is a busy coastal township, which is approximately 300 kilometers north of Brisbane. Hervey Bay has many unique natural features with a spectacular natural environment. Hervey Bay Accommodation and Fraser Island Accommodation provide you with ample opportunity to enjoy the annual whale migration session, great beaches, fantastic fishing and world heritage listed attractions. 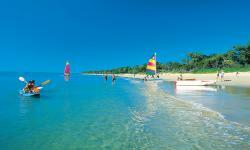 Hervey Bay Attractions also include 45 kilometers of spectacular beaches. Hervey Bay and Fraser Island are some of Queensland's best holiday destinations. 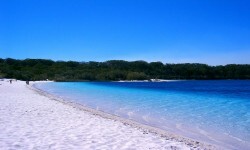 The attraction to Fraser Island is based on the fact it is the largest sand island in the world. Hervey Bay is a relaxed community it provides ample accommodation options and has established a good reputation for growth and holiday activities. The local population of approximately 50,000 is one of the fastest growing in Australia and Queensland. Hervey Bay Holidays and Hervey Bay Attractions allow easy access to Fraser Island. Ferries depart daily or self-drive packages are available with a flight or barge crossing option. Hervey Bay also acts as an access point for Lady Elliot Island, which is the southern, most part of the Great Barrier Reef. Hervey Bay Activities can be enjoyed in pristine water, enjoy such activities as swimming, surfing, kayaking, diving, yachting, water and jet skiing, snorkeling and wind surfing. Other Water Activities Include boating and fishermen can also enjoy game fishing, beach, reef, jetty and estuary. Join tour or charter your own yacht, vessel or houseboat. Hervey Bay allows you to enjoy a cycle ride along the scenic foreshore, visit places such as the Marina area, Orchid House within the lovely Botanical Gardens or sample one of the restaurants and cafes situated along the Esplanade. Visitors to Fraser Island and Hervey Bay can choose from a wide variety of accommodation types, suitable for all budgets and tastes. All of the accommodation resorts, motels, hotels, attractions, tours and holiday venues and general facilities are also accessible for people with disabilities. Fraser Island is just off the coast from Hervey Bay. Some interesting facts is it is the largest sand island in the world, it is World Heritage listed and is the only place on earth where rainforests grow on sand.